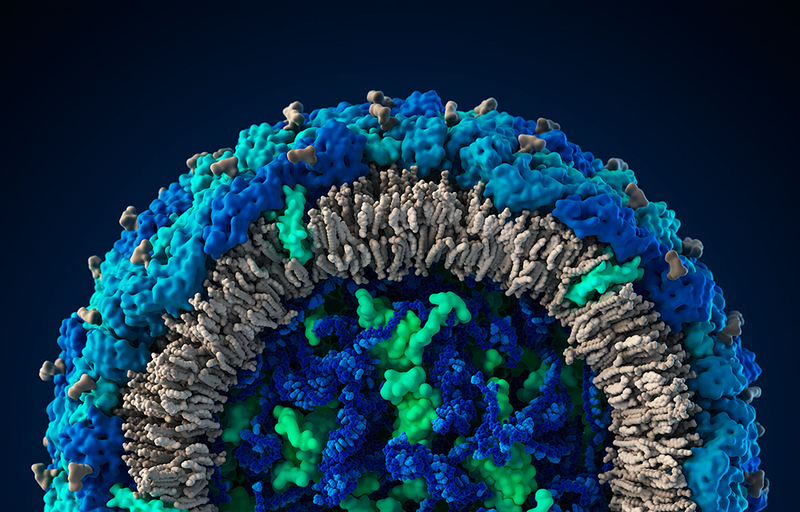 Scientifically accurate 3D model of the Zika virus at atomic resolution. The model compiles knowledge about the virus that is causing global panic. Russian scientists from Visual Science have created a visual model of the Zika virus. The model reflects the scientists' current understanding of the virus's architecture. “It includes 360 distinct surface protein structures, the lipid envelope, and the likely structure of genetic material in complex with capsid proteins,” Visual Science said in a press note. The Zika virus model is a part of Visual Science's Viral Park project, which already includes models of the HIV, H1N1, Ebola and papilloma. The Zika virus was first discovered in the 1940s in Uganda, where its natural carriers were monkeys. But while the local population developed a strong immunity to the virus, it was "noticed" on a global level only after the mosquitoes carrying it appeared in South America and actively settled throughout the continent. Since October 2015 more than 4,000 cases of microcephaly in children born to infected mothers have been registered in Brazil alone, a country that is preparing to host the 2016 Summer Olympics.